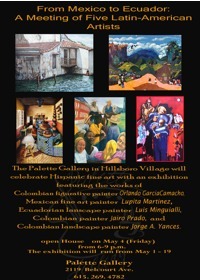 The Palette Art Gallery is showing works from five Latin-American artists through May 19. A reception will be held Friday, May 4, from 6-9pm. More information available by clicking on the flyer.